Chichester Forest Schools offers a range of educational sessions for schools, pre-schools and as alternative provision. Forest School sessions for your school without the time and cost associated with training, equipment, planning and risk assessment, allowing you to deliver forest schools to your pupils easily. Whether you are looking for introductory 6 week programmes, or long term forest school provision, our experienced Level 3 Forest School Practitioners will work with your teachers to provide forest school sessions that build curriculum links and meet the needs of the age and experience of the class. We work with SEN and provide alternative provision. Find out more about our sessions for schools. 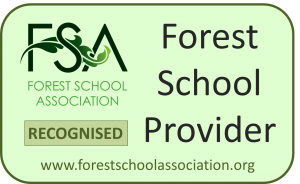 We are a recognised Forest school Provider by the Forest School Association, we have been assessed as 5 star for food hygiene. Alternative provision in nurturing groups or on a 121 basis for children and young people who are struggling with emotional or behavioural difficulties. Those who have have suffered ACE’s (adverse childhood experiences) such as trauma, bereavement, abuse leading to low self esteem and confidence. Find out more about our alternative provision. Rachel and Julia offer Forest School Activities outdoors in a woodland environment. Building confidence, self esteem and a love of nature.